At least three civilians and one police officer have reportedly been killed during a protest against cartoons published in the French satirical magazine Charlie Hebdo. It comes as Muslims across the world united in marches on Friday. "There was one police officer killed and three civilians," a police source told Reuters. "Some of the protesters were armed with bows and arrows as well as clubs. The clashes were very violent in some places," he said. Another 45 people – 23 protesters and 22 police officers – have been wounded. 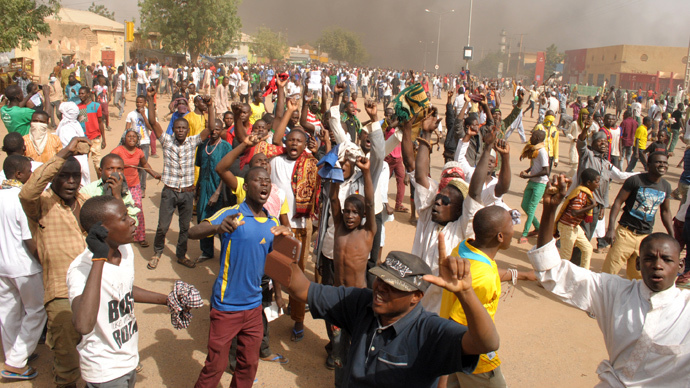 A rally in Niger’s second city, Zinder, also descended into violence as protesters set fire to churches and raided shops run by Christians. A French cultural center was set ablaze by about 50 protesters who broke through the building’s front entrance. Shouting “Charlie is the devil,” they set fire to the cafeteria, library, and offices. "We've never seen that in living memory in Zinder," an administration official told AFP. "It's a black Friday." Outraged by the new magazine issue, Muslim communities staged mass marches across the world on Friday. An anti-Charlie Hebdo rally, organized by the Muslim Brotherhood, gathered over 2,000 protesters in Amman, Jordan. Brotherhood spokesman Murad Adaileh said the group strongly condemns both the killings and the “offensive” against the prophet, AP reported. Holding banners reading "Insulting the prophet is global terrorism," the crowd set off from Al-Husseini mosque in central Amman after Friday prayers. In Algeria, an anti-Charlie Hebdo protest ended in clashes between police and activists who took to the streets to show their disagreement with the satirical magazine’s publication of cartoons of the Prophet Mohammad. Police used riot pellets against small groups of protesters who hurled rocks, fireworks, and bottles. Several officers were injured, Reuters reported. In Sudan, several hundred Muslims marched briefly through in Khartoum, demanding the expulsion of the French ambassador from the country. Pakistani police have also clashed with anti-Charlie Hebdo protesters outside the French consulate in Karachi. Activists broke windows of a few cars, and threw stones at security forces, chanting slogans against Charlie Hebdo and calling for a ban on the magazine. An AFP photojournalist has been wounded and is in serious condition. "AFP photographer Asif Hasan suffered wounds resulting from gunshots fired by ... protesters,” Abdul Khalique Shaikh, a top police official in southern Karachi, told Reuters. "Police have not opened fire." Hasan underwent surgery and "his life does not seem in danger," AFP news director Michele Leridon said. Earlier, dozens of Pakistani lawmakers marched near the country’s parliament in Islamabad, calling for "death to blasphemers." A record three million copies of the new edition of satirical magazine Charlie Hebdo have appeared on French newsstands just six days after its editors were murdered in a terror attack by the Kouachi brothers. New caricatures in the magazine have triggered outrage among Muslims worldwide, as well as threats from radical Islamists.